12 commissions, 12 world premieres, 6 U.S. premieres, and 7 West Coast premieres. This breaks a previous LA Phil record for presentation of new music. The orchestra has never presented as many as 12 world premieres in a single season. 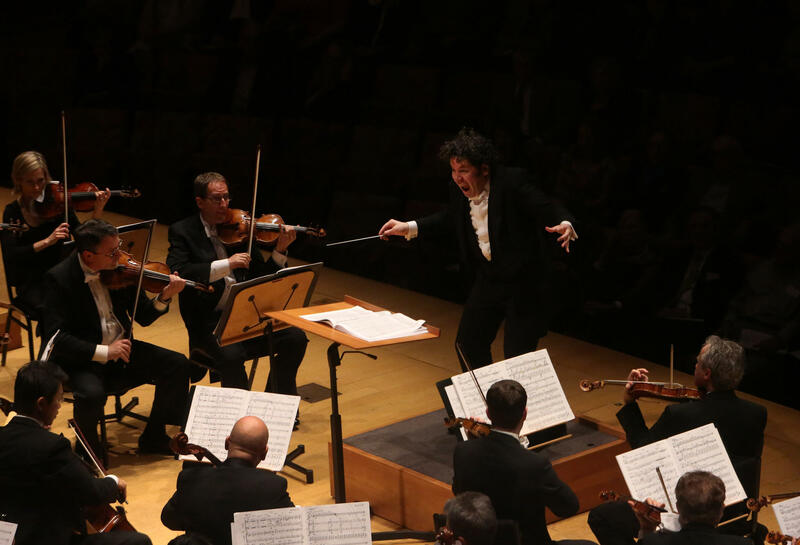 In 2015-16, the LA Phil and visiting artists will present music by 8 different Baroque composers; 5 Classical-era composers; 22 Romantics; and 72 20th and 21st Century composers. Of the 107 composers on the 2015-16 season, 42 are living. That’s 39%. From those 42 living composers, the LA Phil will present 53 different works. An even 200 works on the 2015-16 season: 26 Baroque, 19 Classical, 53 Romantic, and 102 from the 20th/21st Century. That’s 13% Baroque, 9.5% Classical, 26.5% Romantic, and 51% Modern. The most performed composers of the season will be Beethoven (16), Bach (14), Mozart (13), and Arvo Pärt (7). In 2015-16, the LA Phil turns 97 years old, Walt Disney Concert Hall celebrates its 12th birthday, and Gustavo Dudamel has four years left on his contract as LA Phil music director. This is phenomenal news. I was afraid, when I read the headline in the Times this morning, that the LA Phil was turning away from contemporary music and reverting to All Beethoven All The Time. Thanks, Gustavo, Deborah and Chad for keeping Los Angeles at the vanguard of today’s music! Beethoven–the original rule-breaker–is fine, as long as we also get all the other rule-breakers of today alongside.